Wowza – it’s been a whole year since my first donation to OFAPUK. Doesn’t time fly? Today I am checking in to share with you the Octo’s I donated in January. 3. Went to an Angel. I knew this would be the case as soon as I stuffed it – There were so many holes in it it made no sense to sew them up as in the same time I could have made another! This was the first time I used Scheepjes Sunkissed for Octo’s, (I was using the leftovers from my laptop case) and I think my hook was a little too big. Next time, I will use a 2mm and see how that goes. Goodness me, its been a whole year since I joined Octopus for a Preemie and what a year its been. I thought I would take a look back at the year in donations. 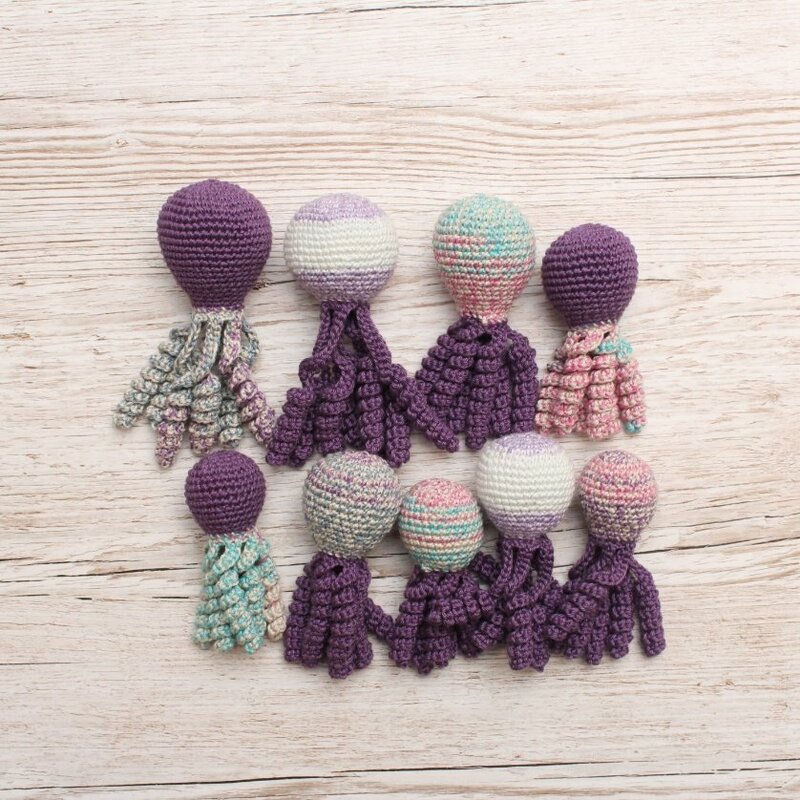 I have made 63 Octo/Jellies/Flatties in total. 45 of those went to preemie babies. The other 18 went to comfort angel babies and their greiving parents. My most successful month was October, where I donated 17 little critters and 100% of them were preemie passes. 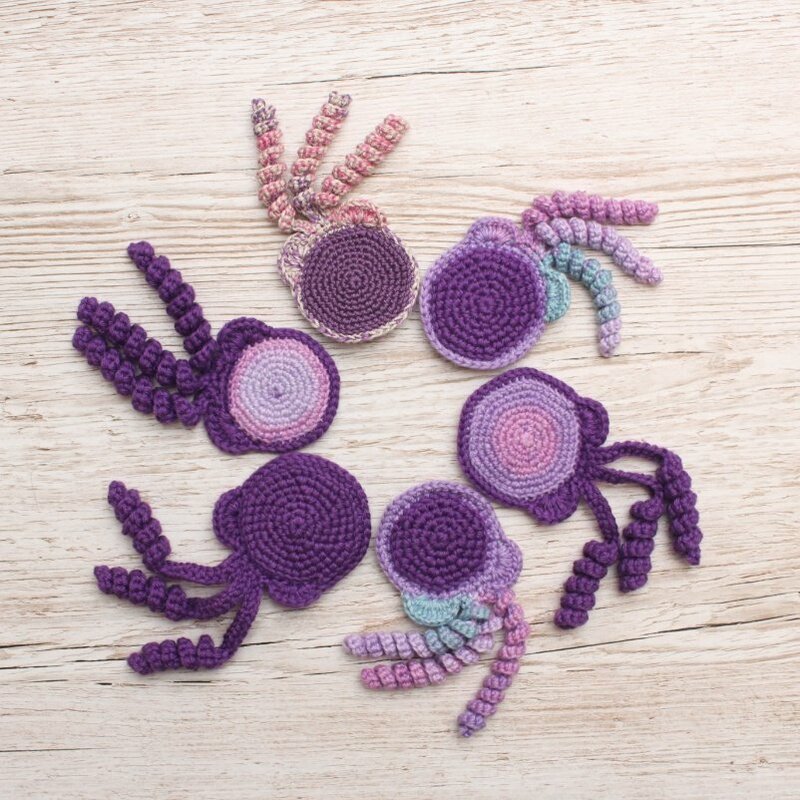 I have crocheted 2281 yards of yarn creating these little critters. I have really enjoyed making these creatures for some of the smallest and most vulnerable members of our society. And the charity has had an amazing year, but they still have so much work to do. 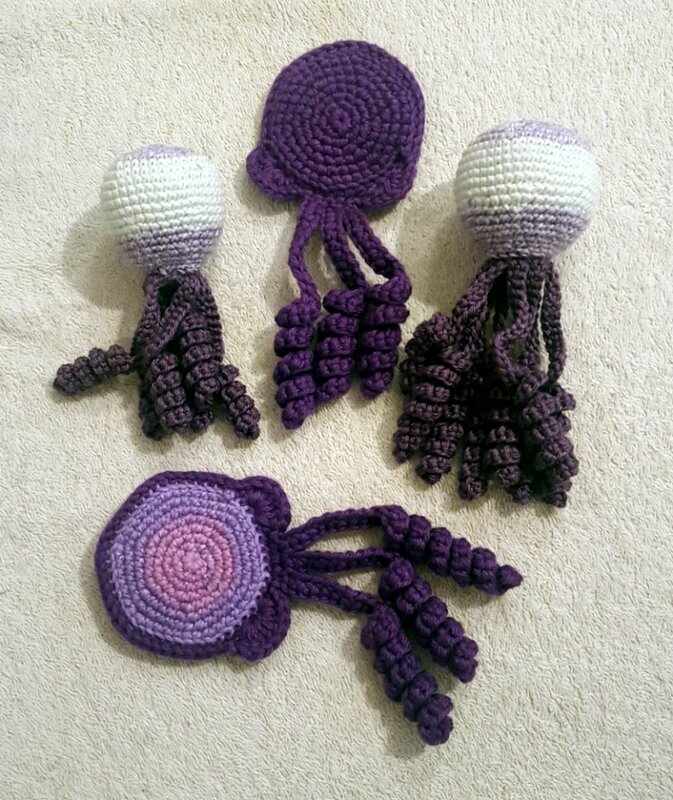 If you love amigurumi and want to give something back please consider joining us. The facebook group has over 20000 members and press articles often say we have over 20000 volunteers but this is a misinterpritation on their part – in reality only around 300 of us are actively making – and we have around 90 hospitals to supply so any more crocheters and knitters who can actively donate would be super welcome! Just type in Octopus for a Preemie UK into facebook. You wont regret it! I tried to use up some part used balls so I used Grundl Cotton Quick Print for these. I will update this post once I know their fates. 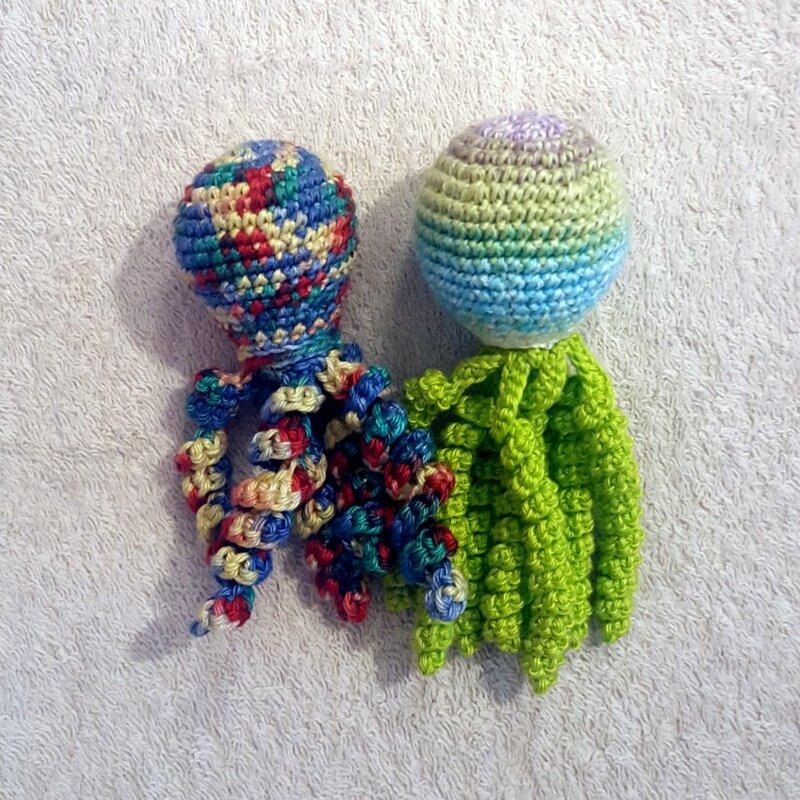 I have had a bumper month of Octo Making in October. I donated 17 Critters in total. And 2 non purple octos. If you didnt know, November is the month of Prematurity Awareness, who’s colour is purple. Hence the purple octos. My co-ord is currently sick so wont be able to check them until her household is out of quarantine. But whatever journey they take, they have a valuable job to do. I can now confirm that all 17 went to preemies! What a result. I am so proud! Its been a while since I managed a mid month review. This is mainly because over the last few months the time has flown so quickly that I didnt even start making them until after the mid month point. I have quite a few already made this month though. First I have these 2, which I made before I knew November (when they would be arriving at their hospitals) was world prematurity month. 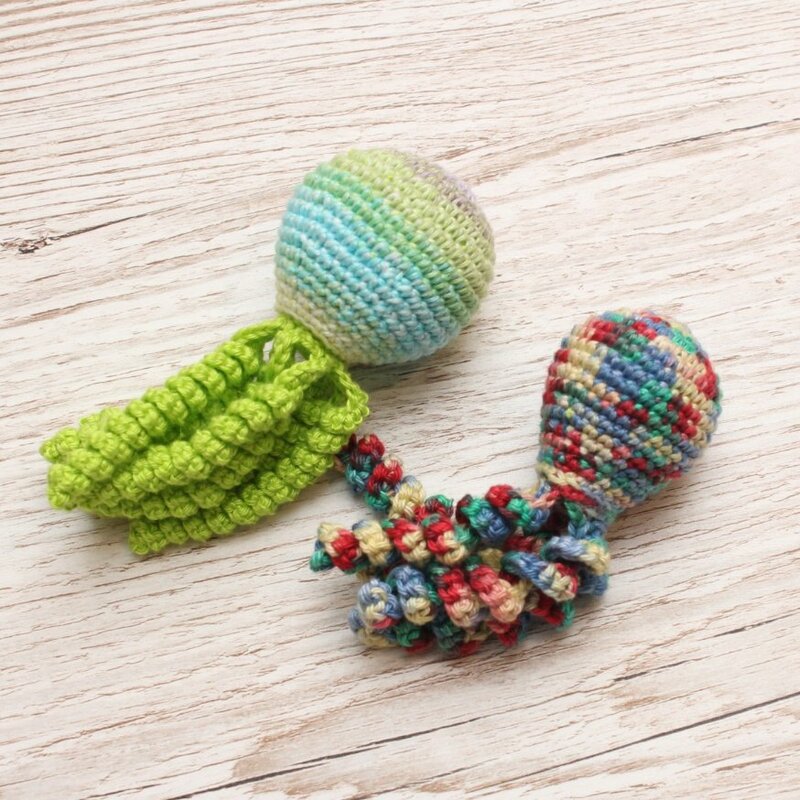 The one with the green tentacles is made with Lana Grossa Cotone for the head and Sirdar Pure Cotton 4ply for the tentacles. The other is Grundl Quick Prints. Then I have this little group, which are made of a mix of Lana Grossa Cotone, Sirdar Cotton DK, King Cole Cotton Soft and Debbie Bliss Cotton. I have been super motivated so far this month. Partly because we fell short of target last month and partly because I love working with purple yarn! 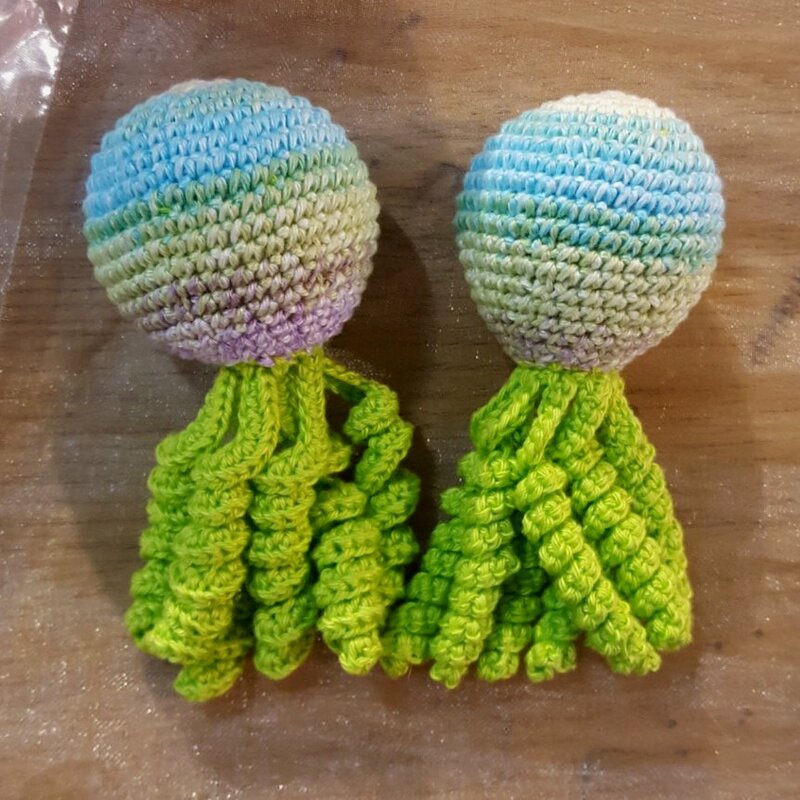 This month I managed to make just 2 Octos. 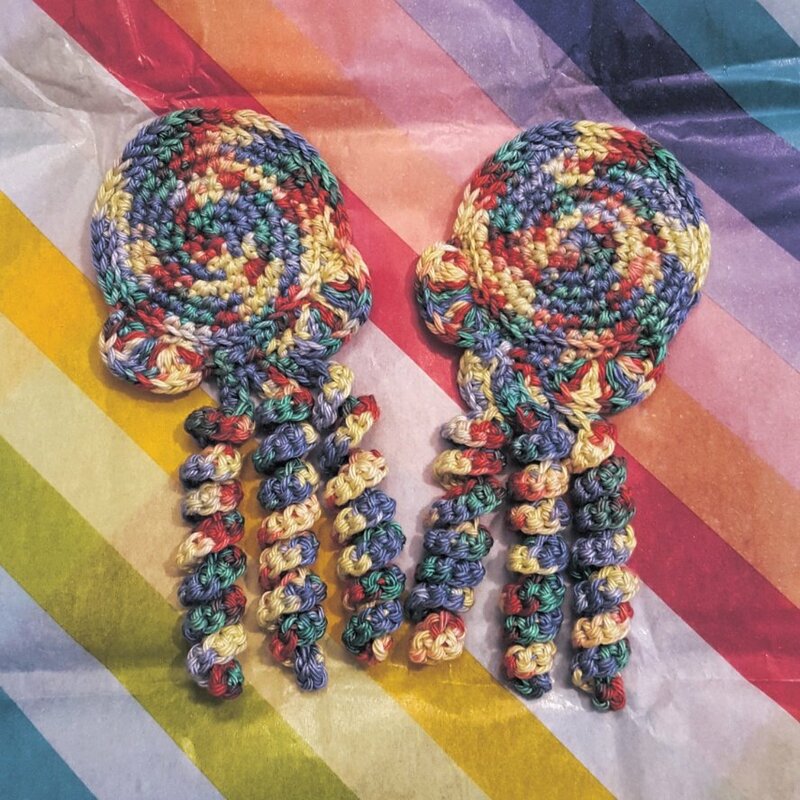 I had actually made 5 heads and had intended to donate them all this month. On the 22nd I went to a meetup and met my co-ordinator. At this point I had completed these 2 so I handed them over. I had intended to go home and send the other three, once complete, to my co-ord in the post. But then the day afterwards, I came down with a cold and havent been cold free since. Booo. Anyways, this month, both octos went to Angels, due to holes around the increases. The advice was to go around with the tail from the magic circle and just reinforce the first few rows. Heres to next month. I should ought to have a bumper crop given that I already have 3 half made! Just as soon as I can budge this cold!